As available residential lots within The Woodlands’ boundaries become scarcer, the master-planned community is expected to reach residential build-out by 2022, three years later than a previous estimate of 2019, The Woodlands Development Company officials said. According to the development company, The Woodlands has room for 815 new residential units, which are expected to be built by 2022, to complete its residential footprint. TWDC Co-president Tim Welbes said while new single-family homes are expected to be available for the next three to four years, non-traditional homes, such as townhomes and condos, are expected to be at a higher demand upon residential build-out. Once residential build-out is achieved, industry experts said they expect the real estate market to shift to redevelopment, while township officials said they expect property taxes to be minimally affected. While most of the villages in The Woodlands have already been built out residentially, areas of the villages of Creekside Park, Sterling Ridge, Indian Springs and Grogan’s Mill are still seeing new communities being built, with more expected over the next few years. According to TWDC, 325 homes will be built in 2019, 240 homes will be built in 2020, 190 homes will be built in 2021 and 60 homes will be built in 2022. New neighborhoods, such as Canopy Green, Jaden Oaks, Notchwood Place and Braided Branch, are all located in Creekside Park and feature new homes. Meanwhile, other villages, such as Grogan’s Mill and Indian Springs, also have a few new communities with room for new lots, such as Woodlands Reserve and Grogans Crest. Welbes said the development company is still creating new residential areas in the villages of Creekside Park, Indian Springs and Grogan’s Mill. As The Woodlands moves closer to build-out, residential development is expected to shift its focus north on I-45, according to development officials. Located just north of Conroe, The Woodlands Hills is the newest master-planned community from TWDC, Welbes said. Builders are nearing completion on model homes in the area as lots begin to sell. Officials from TWDC said build-out in the community will likely not take place for another 10-15 years, and residents are expected to begin moving in to the area this fall. The Woodlands Hills will feature 20 neighborhood parks, dedicated bike lanes, an amenities center and 112 acres of open space. Zach Richmond, a real estate agent with Richmond Realty Group-RE/MAX The Woodlands and Spring, said he believes once residential build-out is reached, the local real estate market will shift to renovating older homes. Richmond said he also expects to see an increase in rental homes and multifamily residential options to meet the growing demands of millennials. The Howard Hughes Corp. announced in June it will build an additional 386 multifamily units in Hughes Landing in the next two years. The project is expected to be complete by spring 2020 and will feature space for retail and restaurant tenants on the ground floor, according to a June 23 announcement from TWDC. Richmond said he hopes The Woodlands residential build-out process includes the construction of more one-story homes as he has seen a greater demand for these types of dwellings. Once new homes are no longer available inside The Woodlands, Richmond said homebuyers will likely consider nearby areas such as Shenandoah, Oak Ridge North and Spring. New developments like Harmony, which is located near the Grand Parkway on Rayford Road, and Bristol Lakes, which is also located near the Grand Parkway in Spring are becoming popular among homebuyers, local real estate agents said. Harmony is expected to have 2,300 homes at build-out, while Bristol Lakes will feature 200 lots at build-out, according to Bristol Lakes and Harmony officials. Once the community reaches build-out, The Woodlands Township will see a halt in the number of new residential properties being added to the property tax base each year. 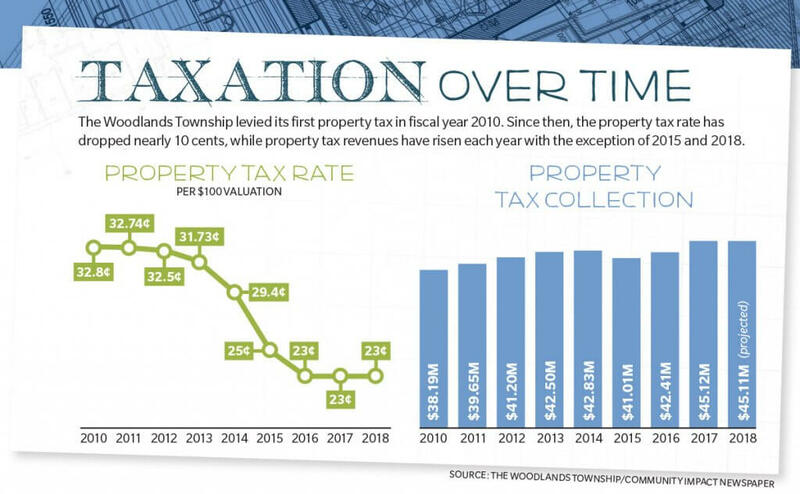 Property taxes account for 36 percent of the township’s overall budget, according to The Woodlands Township. Based on estimates of new houses to be built over the next four years, the township anticipates to receive $379,270 in additional property tax revenue in 2020, $362,480 in 2021 and $86,595 in 2022 based on a property tax rate of 23 cents per $100 valuation. However, Monique Sharp, assistant general manager of finance and administration for the township, said the property tax base is not expected to affect the township’s budget. Median home values in The Woodlands have increased overall each year, rising 29.2 percent from 2011 to 2016, according to the U.S. Census Bureau. Nick Wolda, president of The Woodlands Convention and Visitors Bureau and director of community relations, said The Woodlands can rely on commercial growth for economic success. “Ongoing commercial growth within the township and projected significant population growth in the region will contribute to continued economic growth for the community,” Wolda said.